Americana is not moving forward. See what you can do to bring it back on the game. I am pretty sure you are all aware of the bad news, but i would like to write about it as well. One week ago "ABC" announced it's new shows and unfortunately Americana isn't one of them. That was kind of shocking for a lot of us, since buzz for Emilie's new pilot was more than positive. Until the very last moment, it wasn't clear if Americana was gonna made it or not. Actually, some sources claim that there is still hope for the show. If you ask me, this is kind of impossible, but at least there is something we can do. As ash-greene.org informs us Emilie de Ravin France and Ashley Greene Central started a petition for the unfair decision of ABC not picking the “Americana” after all the positive words we get that it was a sure thing.(...) I think this is a great way to express how much we want Americana to move forward. If you want to sign the petition click here: http://twitition.com/3e9b5. Americana's impressive cast includes actors Annabeth Gish, Anthony LaPaglia, Ashley Greene, Christine Adams, David Alpay, Emilie de Ravin, Ken Olin, Natalie Mendoza and Tiffany Hines. Alistair Maclean’s highly charged novel is brought to life for a contemporary audience in this tense, international thriller. Over a decade after the atrocities of the Yugoslav civil war, General Arkady Dragutin, a Serbian warlord wanted for genocide, torture and crimes against humanity, is finally captured by Irish UN Captain Fergus Markey. Meanwhile, glamorous all-American reporter Francesca Romero is given the job of a lifetime aboard Air Force One as the US Secretary of State flies to Belgrade to help broker Serbia’s entry into NATO. But within hours a national emergency arises when the aircraft’s pilots lose control and they disappear from radar. Air Force One is down. Back on the ground, Markey discovers support for Dragutin is still strong in Serbia when a local military unit in a hunt for the General’s faithful Lieutenant Miloz Petrovic betrays him. Markey flees for his life, pursued by the soldiers who are now under Petrovic’s orders, and goes to ground in the mansion of despondent British diplomat and former MI5 agent Sebastian Fanshawe. 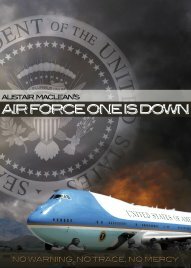 The two reluctant companions escape Petrovic’s militia and are shocked when they happen upon Air Force One on a disused airfield and some of its passengers being escorted away by armed men. Momentarily, in America a phone call gives a two-hour deadline for the exchange of the Secretary of State for the imprisoned Dragutin. Francesca Romero, who is in fact a Russian intelligence agent, escapes and teams up with Markey and Fanshawe. As they attempt to unveil Petrovic’s scheme a stealth bomber also goes missing and a message is issued threatening to bring death and terror to the very heart of Europe. This exhilarating, fast-paced two part mini series sees unlikely allies formed in a quest to save one of history’s greatest cities, and the lives of millions. This article comes from here: www.powcorp.com. 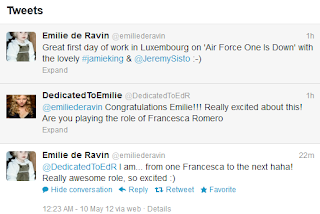 Thanks to Rachel Leigh from FanForum for finding it!